Make your own Sundae by choosing any Ice Cream flavor topped off with Whipped Cream and a Cherry, and any 2 toppings. Also try our Signature Sundaes which are packed high with amazing Ice Cream topping combinations. Our thick Milkshakes and Malteds are popular all year across Queens. Choose any flavor of Ice Cream or Gelato, and enjoy a rich treat. We also have Signature Shakes with fantastic flavor combinations and toppings mixed in. Pick your favorite Italian Ice flavor or two, and we will blend it up into a fantastic and refreshing Ice Shake. It’s like a cross between a slushie and a smoothie, in any flavor you want. Try our Signature Ice Shakes, or make your own. A Float is your favorite Ice Cream gently resting on top of your choice of soda. An Ice Cream Soda is your favorite Ice Cream floating on flavored Seltzer. Both of these come topped with whipped cream. An Eggcream is a frothy drink of seltzer and Chocolate milk. 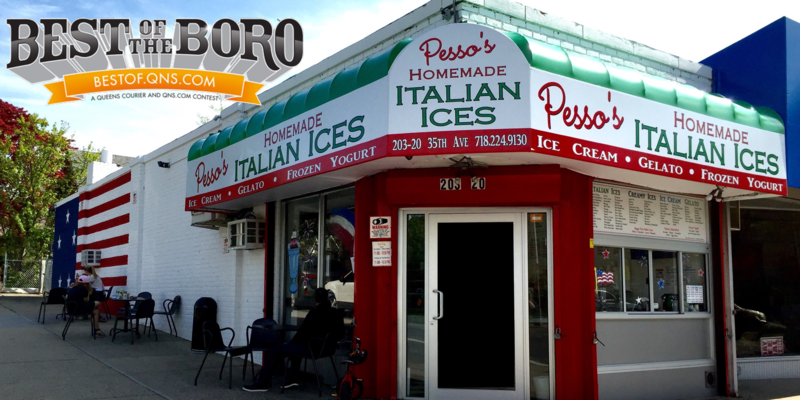 This classic Ice Cream Parlor treat is perfected at Pesso’s.